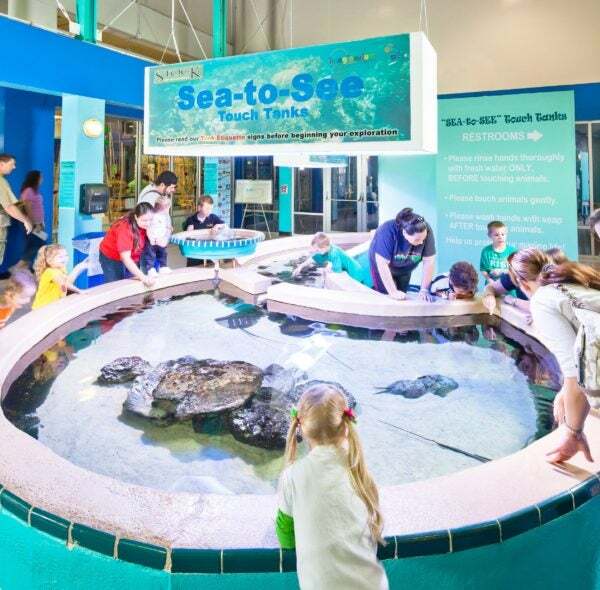 Get a hands-on experience at the SEA-to-See Touch tank. If you visited the Imaginarium in the past, it’s time for a return visit. The Imaginarium and the Southwest Florida Museum of History combined earlier this year. The newly named IMAG Science and History Center features everything from Fort Myers history to a megalodon fossil. It’s truly a multigenerational experience. 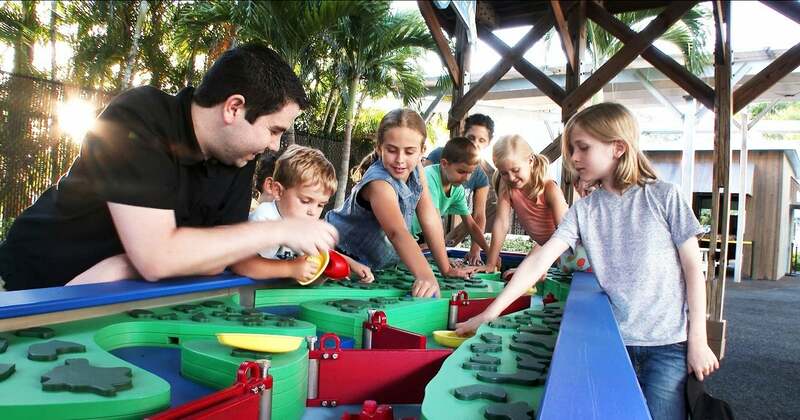 IMAG (pronounced “eye-mag”) has more than 60 interactive exhibits plus hands-on educational programs that allow guests to explore science, technology, engineering, and math (STEM), as well as the history of Southwest Florida. 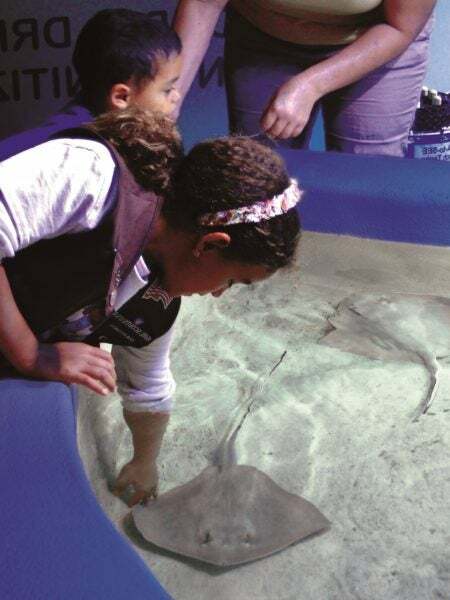 The SEA-to-See Touch tank offers encounters with stingrays, horseshoe crabs, hermit crabs, sea stars, urchins, marine snails and more. You can even feed a stingray out of the palm of your hand at 11:45 a.m. and 2:45 p.m. The cost is $3 per ticket and quantities are limited. There is a 3,200-gallon aquarium displaying a variety of fish, including sharks, and the Living Lab houses turtles, a ball python, frogs, a bearded dragon, prairie dogs and other critters. Catch the Animal Encounters at 11 a.m. and 2 p.m.
Sign up to feed the stingrays out of the palm of your hand. The 3D Theater-in-the-Tank has several showings daily of Jules Verne’s 20,000 Leagues Under the Sea reimagined to explore the ocean habitat. At the Earth and Space Science exhibits, touch a cloud, understand why lightening happens and learn how electricity works. Strengthen your brain with Mind Magic puzzles in the Hands-On Hall. Go outside and visit the Fisheye Lagoon, which is filled with a variety of aquatic life, turtles and migrating birds, and see the Backyard Nature exhibit and short walking path. Hall of History exhibits take you on a walk through the history of Southwest Florida, including some featured sites of interest in Fort Myers. Calusa Indians, a large complex empire among the first inhabitants of Southwest Florida, are prominently showcased, highlighting the industrious tools they crafted from natural materials from the area’s rich estuaries. Other items on display include a miniature replica of First Street in downtown Fort Myers as it appeared in 1900; artifacts from the site of the original fort of Fort Myers; and historical objects from Florida’s prime cattle raising era. You’ll also find fossilized bones of a giant sloth, a megalodon, and a saber-toothed cat, representing what would have been found here in the Ice Age era. 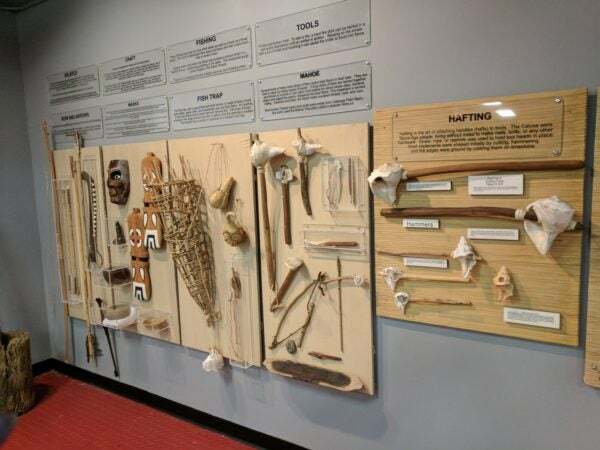 Hall of History exhibits include information about the Calusa Indians. In the Virtual-Reality Exhibit, immerse yourself in an interactive environment that takes you back over 150 years to see and experience the original fort of Fort Myers. The IMAG History and Science Center is located at 2000 Cranford Avenue in Fort Myers. Hours are Tuesday through Saturday from 10:00 a.m. to 5:00 p.m. and Sunday from noon to 5:00 p.m. Admission is $12 for adults, $10 for seniors 55+, $8 for children, and free for children 2 and under. Parking is free. For more information, visit theIMAG.org, call 239-243-0043. Book your family-friendly Fort Myers Beach trip today with Sun Palace Vacation Homes.